Bring those UFO'S ... UnFinished Objects ... to seminar. This is a great way to stitch with your friends and maybe have one less (or maybe two) UFO's in your stash by the end of seminar! The Rose Sampler boasts a lovely palette of rose and green thread as well as a quote from “The Secret Garden.” The techniques included in the sampler are: cross stitch, bead attachment, oblong cross stitch, backstitch, double running stitch, upright cross, four-sided stitch, herringbone, satin Stitch, barrier, plait, Montenegrin and creating a personal monogram. Kit Contents: 19” x 10” of 32 count pale green/Water lilies linen (students may request 28 count linen). Threads: 5 shades of Perle cotton, 2 shades of glass beads, 11 shades of DMC floss, 1 shade of overdyed silk. Tapestry needles and beading needles. Class Title: Buttons! Buttons! Buttons! Button, button, who’s got the button? You do! Create a simple necklace or pin with buttons. In this class you will learn 4 different designs for wrapping metal or plastic rings and 2 for wrapping silk covered wooden button forms. Once you know the basic wraps, you can explore a multitude of variations, playing with color, ring size and or thread size. 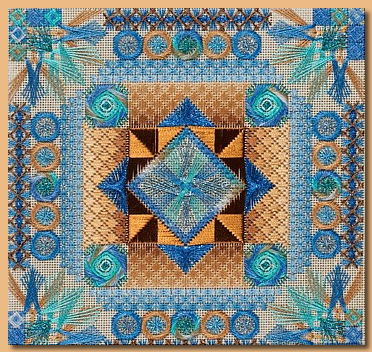 The kit will include a couple of dozen rings in various sizes, wooden and metal button forms, at least 12 colors of perle cotton and 12 colors of crochet cotton, silk fabric and findings. Kit Contents: Wax, needles, cord and necklace findings, pin back, clover clip, washers, rings, wooden button forms, buttons, Perle cotton, crochet cotton, silk fabric, cording, small piece of batting and instruction booklet with color photos. Couture embroidery on canvas. Today the sapphire gem is known as a Stone of Wisdom, a royal stone of learning and sharpness of thought and vision. It is said that its pure blue light brings order and healing to the mind, lending strength and focus, and an ability to see beneath surface appearances to underlying truth. 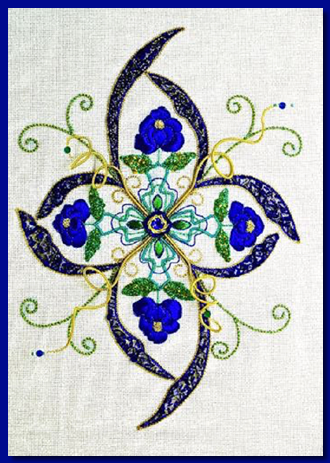 From the world of couture and gold work on a foundation of congress cloth, this class will explore a variety of techniques: Chipping, S-ing, couching with and without beads, un point de vermicelli on Perle, plus the application of sequins with and without beads and montees. Design Area: 8" x 10"
Kit Contents: All materials necessary to complete the design except the working frame: Congress Cloth, ecru 14” x 16”, silk threads, metal thread, beads, sequins, wire, invisible thread needles, and photos and instructions. Student Provides: 14” x 16” stretcher bars, pencil, scissors – one for cutting silk & one for cutting metal, laying tool, thimble (if you’re used to working with one), a devise to hold the frame steady, frame or hoop, light and magnification (if needed by student), small tweezer, set of frame magnets. Adagio is a symmetrical design with complexity in every quadrant. The center features a Kitty’s double fan doubled (a double fan doubled surround by an additional double fan doubled, giving an intricate knotted look to the stitch). Working out from the center are right angle sprat’s heads, triangle Amadeus, four layered Jessicas over a ray stitch, interlocking Jessicas, and more fan stitches. Lots of movement and intricacy in the design, a challenge for counted canvas stitchers. Stitches used: Kitty’s double fan doubled, layered Jessicas, interlocking Jessicas, triangle Amadeus, right angle sprats, plaited rays, pavilion diamonds, waffle, oblong criss-cross rectangles, double herringbone, tied oblong crosses and diamond Rhodes. Design Area: 8" x 8"